Nephi, after hearing about his father's vision of the tree of life, desired to see the same things his father saw and was granted this request. Upon seeing the tree in vision, he desired to know its interpretation. Nephi then saw the coming of the Son of God and knew that the tree of life represented the love of God. He soon learned the meaning of several other symbols in his father's vision, as this chart illustrates. The angelic ministrant also showed Nephi episodes of world history, including periods of war, colonization, apostasy, and wickedness. 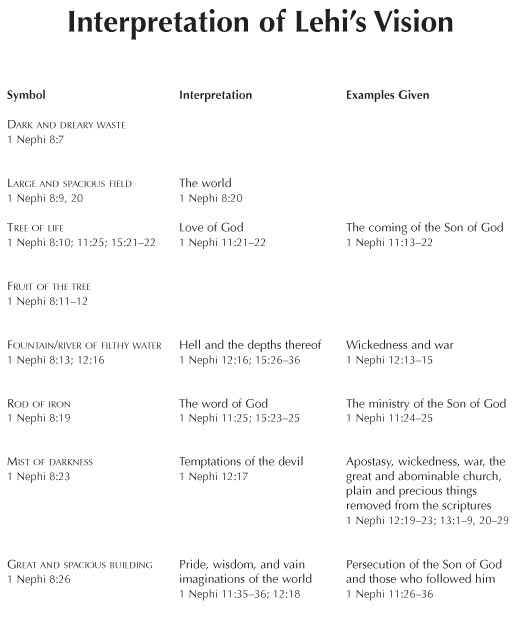 Thus in light of 1 Nephi 11–15, the vision of the tree of life can be seen not only as a powerful illustration of God's love shown through the atonement of Jesus Christ, but also as an allegory of the history of the world, as the right-hand column of the chart illustrates.